English teacher John Keating inspires his students to appreciate poetry and make the most of their lives. "Dead Poets Society" is a collection of pious platitudes masquerading as a courageous stand in favor of something: doing your own thing, I think. It's about an inspirational, unconventional English teacher and his students at "the best prep school in America" and how he challenges them to question conventional views by such techniques as standing on their desks. It is, of course, inevitable that the brilliant teacher will eventually be fired from the school, and when his students stood on their desks to protest his dismissal, I was so moved, I wanted to throw up. Peter Weir's film makes much noise about poetry, and there are brief quotations from Tennyson, Herrick, Whitman and even Vachel Lindsay, as well as a brave excursion into prose that takes us as far as Thoreau's Walden. None of these writers are studied, however, in a spirit that would lend respect to their language; they're simply plundered for slogans to exort the students toward more personal freedom. At the end of a great teacher's course in poetry, the students would love poetry; at the end of this teacher's semester, all they really love is the teacher. One of the major problems with ''Dead Poets Society,'' Peter Weir's dim, sad new movie, is that although John Keating is the most vivid, most complex character in it, he is not around long enough. He is really no more than the catalyst who brings about events over which he has no control. ...the movie undercuts Mr. Williams's exceptionally fine performance, making the character seem more of a dubious fool than is probably intended. Mr. Weir (''Picnic at Hanging Rock,'' ''The Year of Living Dangerously'' and ''Witness,'' among others) obtains some very good performances from the younger actors, particularly from Mr. Leonard, and from Norman Lloyd, who plays the headmaster. Yet the director cannot resist tarting up the movie with the fancified effects that pass for art: broad, eerie shots of birds taking off (or landing), night scenes prettily lighted from sources of illumination that must have been provided by the gods, along with scenes from an amateur production of ''A Midsummer Night's Dream'' in which Puck (for reasons that have more to do with the movie than the play) wears Christ's crown of thorns. Like that crown, the movie is too heavy for its own good. So, do you think these assessments of the film are correct? And is Williams successful with the material? Some other fascinating trivia bits over at IMDb.com. I think I agree with parts of Canby's assessment, and not much of Ebert's. I watch that movie for mostly for the utterly brilliant and inspiring character played by Williams. I was also an English/Theater kid so what the students explore hits a few of my buttons as well. As I read these reviews, and think about the film more, I'm tempted to see the character of Keating like the character of Puck from A Midsummer Night's Dream - a sprite that dashes in an and out, driving the plot forward and encouraging all manner of wildness. That's possibly reading too much into it, but I could see it being intentional - a play within a play within a play. All that being said, I am unashamed to say Dead Poets Society is one of my favorite films. Where the reviewers found it heavy-handed, I found it engrossing. Even with the ups and downs, it's a film I watch to be inspired. phildini, that's a really interesting parallel to draw. What happens when Puck's actions have consequences? This is one of my favorite movies ever. I'm pretty sure I've seen in more times in a theater (four) than any other movie, plus numerous rewatches at home, most recently in the wake of Williams' death. I wrote about the movie's impact on me in the Robin Williams obit thread, but I think it bears repeating. I was just about the same age as the students in the movie when it came out; I had just graduated from high school in summer 1989. As a shy, awkward, introverted kid I identified a lot with the Todd Anderson character. I'm still introverted, but now less shy and less awkward, and I think Dead Poets Society is part of the reason why. As I've grown older (as I age and movie characters don't, I'm now closer in age to Keating than to the students), the only criticism I've come to have with the movie is that Neil's father (Kurtwood Smith, now hard not to see as Red Forman, but this was before That '70s Show) is rather one-dimensionally drawn, to be a villian, in a movie otherwise filled with well-rounded characters. 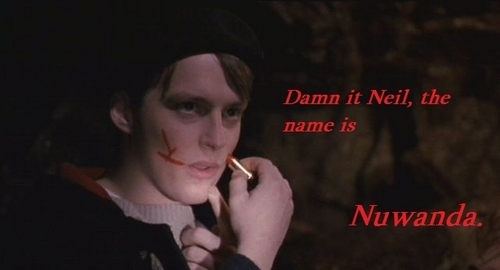 Still, that's a minor point, and it's still one of my favorite movies ever. The film won the Academy Award for Best Original Screenplay for Schulman, and also received nominations for Director, Actor (Williams), and Best Picture (losing to Driving Miss Daisy; even though I would have preferred to see DPS win, I can't really argue with the Academy's decision there). I used to be an English teacher. Though there are plenty of awful movies about teachers (e.g. 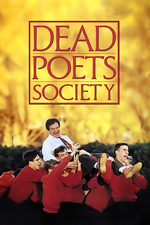 the white savior tropes of Dangerous Minds and Freedom Writers), Dead Poets Society has always taken the cake for me. I'm influenced in part by the Ebert review: the movie boils down English teaching to the presentation of inspiring out-of-context quotations. It just bears zero relationship to what I saw good teachers doing, and I saw plenty of bad teachers who were influenced by Keating: posting inspirational quote posters and saying inspirational things without actually trying to make the kids do anything. The film's race and class politics are atrocious -- the lipstick-face of Nuwanda, the way the marching band drums of the less-affluent public high school kids down the road evoke Nuwanda's generic African-ness as somehow being a more sexually connected and authentic form of being. I actually think this movie is evil. The whole Nuwanda thing--at least since I was old enough to start questioning narratives about race and class--reads to me less as exploitative and more as "this would have been acceptable then, which is totally fucked up, and should throw into sharp relief all the other beliefs taken for granted by the characters in this film." I got around to watching this a few days ago, and it was much, much better than I remembered. I think the film is channeling on two things buried deep in the American psyche: "A Separate Peace" by John Knowles, and J.D. Salinger's "The Catcher in the Rye." Both play on our desire to be close to youth, beauty, and to experience vicariously what it's like to be a rich (or somewhat well-off) kid (the private school settings). People have brought up problematic treatment of race (tribal as more primal and allowing one to "go wild" and express their animism), but did you get uncomfortable during the scene when one character pets the sleeping girl's head and decided to kiss her? Noooooo! I grew increasingly uncomfortable in that scene - I know you're supposed to read it a different way, but alas, I cannot read it that way, and it made me glad when her "bad guy" boyfriend punched him (one of the few times I've been rooting for the wrong person!). I would say this is a must-see from our Robin Williams series here on FanFare. None of these writers are studied, however, in a spirit that would lend respect to their language; they're simply plundered for slogans to exort the students toward more personal freedom. At the end of a great teacher's course in poetry, the students would love poetry; at the end of this teacher's semester, all they really love is the teacher. Normally I am sympatico with Roger Ebert, but I loved this film and I had a tangentially similar experience to what is depicted here in high school. No suicide or anything, but our small private school hired a new English teacher who arrived from another state (California! ), was a bit of a nonconformist outsider with a mysterious life, did things differently while he was there which sometimes got him in trouble with the administration, and CHANGED OUR LIVES. He treated us not like irresponsible kids but like almost-adults who would soon be making our own decisions, who deserved to be given the straight story, and who needed to be made to understand the relationship that great literature and poetry has TO YOUR REAL LIFE. The huge import of a teacher like this isn't that s/he teaches you how to ably deconstruct a poem, or do a close reading of a Kafka passage. It's that s/he makes you start to understand that you're not a student, you are a human being alive in the world who is in charge of your own life. Much of a student's life until high school is all about being told what to do -- go to school, do your homework, stay in the lines, be obedient to your teachers and elders, try to please your parents. Then at some point in high school you realize (maybe with the help of a teacher like this) that you are almost an adult, and soon you will be in charge of your own destiny, and it's up to you to make it count, to seize the day, to gather your rosebuds while you may. And for these boys, who were likely going to be cannon fodder for Vietnam, taking control of your own life would have had that much more importance. It's not about becoming a better English student. It's about becoming an adult and taking control (or trying to take control) of your choices and your life, and the incredible almost intoxicating feeling you get from coming into your own. I sort of had a teacher like that, and I loved this film.